It’s January 2017. 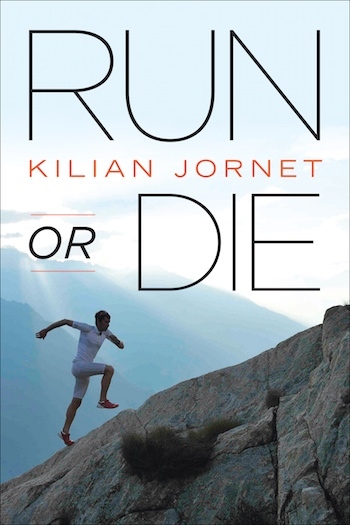 I hadn’t even begun to read trail running god, Kilian Jornet’s “Run Or Die” book yet, but minutes after I bought it for some crazy price over $13 for the digital ebook (.mobi format) version, I’m here starting this review. I have to say, I am not happy paying such an extreme amount, but the book needs to be read and I’m too amped up not to read it! I’m not a crazy person paying over ten-dollars for a digital book, I was just caught up in the moment as Kilian had just set another course record about twenty minutes ago, this one at the Hardrock 100 Mile race. I knew of Kilian’s book for over two years and I just couldn’t bring myself to pay $13. After this race, I immediately went to read the sample, and it blew me away. I bought it immediately. Kilian Jornet is a world class trail runner and ski mountaineer. By world class I mean he is at the absolute top of the world in ultra-distance trail running (50 to 100 km distances especially), and even the mountain races (Sky Races) which are short and very intense hill climbs of 1 kilometer, a mile, or more. His VO2 MAX, the measure of how well the body can get oxygen to the muscles, is an astonishing 92 ml of oxygen per minute per kilogram. That is very close to the highest VO2 MAX ever measured in human beings. He was made for mountain running, he grew up there at 6,500 feet altitude, he played there and mentioned he was summiting mountains at three and five years old. While running home one day he took a wrong step and wrecked his knee. He mangled it so badly they had to put a metal kneecap in for support for a while. Later when it was removed, he was horrified to see his shriveled up leg. He started exercising immediately to bring himself back up to competition level fitness. He’d ski when he could barely walk, risking destroying his leg forever in a fall. Before long his leg, his knee appears to have mended as good as new and he was back to training and racing. And winning. Kilian starts the book out by diving right into his obsessive, one-track passion – exploring, then racing on the mountains on foot and on skis. He finds he has some ability early on, winning races as a junior to such a degree that he seeks the best adult races in his area, and wins there too. Throughout the book, Kilian free-flowed the stories about competition and the drive that possesses him. Rules him. He is (or was, at the time of writing) a man with a singular goal – winning. It drives him to train what anyone reading would term, ‘obsessively’ or ‘fiendishly’! The entire book, with the exception of mentioning a brief love interest, is focused on describing participating in a competition or preparing for it. Kilian recounts how he reviews every detail of an upcoming race, and how when he isn’t listening to REM or some other motivational music on his headphones, his mind is either working over and over on the possibilities and the best possible action he can take to win the race, or, he is lost in a fantasy game he creates to make things interesting. He mentioned a few times that when he is bored – usually when he’s so far off the front he can’t see anyone – he resorts to creating some fantasy situation like he is chasing people who just set his home on fire, or he is a fugitive from justice and running through the mountains to escape! Some of you may find that hilarious, unfortunately, I don’t because I also do weird stuff like this. Have you seen my “Pushing Yourself” Series? Here, go have a look when you’re finished here – PUSHING YOURSELF HARDER! I enjoy making fantasy type situations up as I run because they help me push faster and further without feeling like I’m expending more energy. I can go faster or further without directly confronting it, my mood carries me because it’s a game. I think more people should use something like this. I think the potential for improving your running or any exercise, can be massive. Though Kilian doesn’t mention it in that way, he does it enough and it has pulled him out of a fog many times as he races, so I’m sure he would agree with the benefits of using it for training and races! I’m not sure what his relationship is or was with his father growing up. He didn’t mention him at all until 86% through the book when he was describing his preparation for the Mount Kilimanjaro record climb attempt. He said his father guided some people up the mountain the week before, so he joined Kilian’s attempt to add his experience. That was it. Nothing else said about him. Meanwhile, he often mentioned his mother and what they did together. So, just curious to know more there. The bottom line is, if you are a student of pain, of suffering through some endurance sport that you are firmly addicted to – this book is mandatory reading. Kilian is at the very top of a list of extremely accomplished trail runners and skiers. He is not just at the top, he is so far beyond others that he stops to wait for people to give him some company in the middle of some of the toughest races on the planet. He got lost for 30-40 minutes at the latest Hardrock 100-mile course because someone ripped down the trail markers, and he STILL set the course record by 50+ minutes. I’ve made it mandatory for myself to listen closely to every word that comes out of his mouth. Usually, he’s very down to earth about his super-human accomplishments, but in this book, we get a closer look at what makes him tick. We see the brutally competitive nature of Kilian and what he thinks about as he’s pushing himself beyond mere mortal limits. The book is surprisingly well-written and deep. It flows well, but it isn’t a story of Kilian’s life so much as a look into what he is beneath the veneer or an ultra-nice guy. I finished this book in two days, it’s that interesting. If Kilian writes another book – would I read it? Would I pay $13 for the digital version? I’d definitely read it – and I’d pay up to $30 for any version I could get my hands on. This is a book for endurance fiends, for competitors that push themselves to the absolute limit and who want to see how the best in the world goes about it. It is also a book that gives you a peek into the mind of an athlete so far above the rest of the best that he waits for them in the middle of the race so he’s not bored. It is VERY interesting to me to read this book now, after a couple years of following Kilian on the ultra-trail running circuit. In interviews, he doesn’t mention winning races and setting records at the important part of doing what he does. His personality is anything but boastful. He’s the ultimate gentleman and kind spirit. Perhaps he has mellowed a bit, after realizing he can win any race he chooses – from the short and steep hill climbs in the Sky Races, to climbing mountains in Africa he’d never seen before in record time – blowing away the old record. Seems like Kilian has matured a lot and now finds satisfaction in pushing himself as he wishes – not according to some prescribed way to train and race. It’s why you’ll sometimes see photos or videos of him leaping into the air during a race and clicking his heels. I think he figures if he’s not having fun, there’s no point at all being out there anymore. HIGHLY RECOMMENDED. MINDBLOWING. NEAR PERFECT.